Something I’ve wanted to try my hand at . . . for quite a while now. My first try wasn’t perfect, but they are presentable and quite delicious. These would be the perfect Valentines Day Gift! 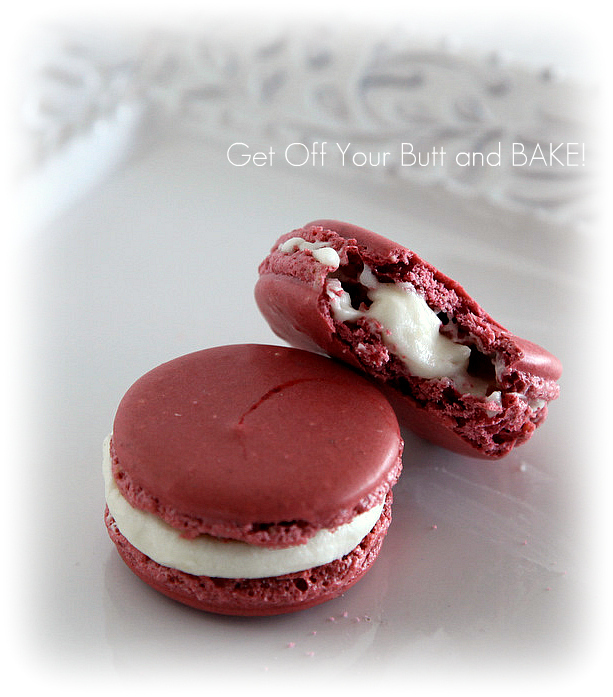 If you blog hop at all, then you know that everyone is talking Macarons. I’ve never found these in local bakeries, and knew I wouldn’t be flying to France anytime soon! How was I to know what all the hype was about? I’ve read post after post on these delightful little meringue type cookies. The general consensus, is how difficult they are to master. They really only consist of egg whites, powdered sugar, white sugar, almonds, flavoring & of course food coloring. 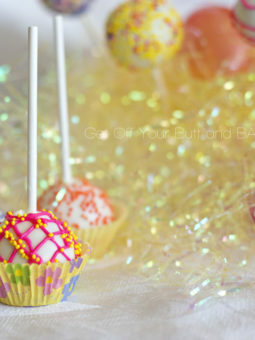 Then you fill the crispy, chewy little numbers with some type of Buttercream, ganache, berry, etc. When I decided I was going to attempt making Macarons, two things held me back. First, every recipe that I could find, listed grams (metric) method of measuring. Well . . . I don’t know about you, but I haven’t used the metric system since High School. Around these parts, we use the imperial method of measure. Anyone that knows anything about Macarons, suggest measuring every ingredient on a kitchen scale. That was of course my second problem. I have a lot of stuff in this house but a Kitchen Scale wasn’t one of them. The suspense was killing me though. What was so darn great about these french pastries? I had to find out once and for all. First step was find a trusted recipe, from someone who seems to turn everything to Gold. That someone is Helene of Tartelette. She is a master of French Macarons . . . so it only seemed correct to use her expertise and her recipe. 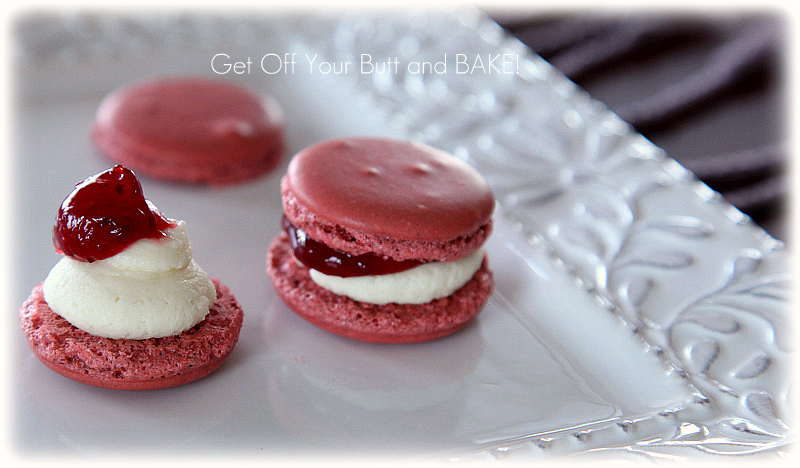 There are actually two known methods of Macaron Making. One is the French method, and the other is the Italian Meringue method. I will exlain the difference in another post. The next logical step was to purchase a Kitchen scale . . . and I did. If you are interested, I found one at Bed Bath & Beyond for a reasonable price, and it’s the OXO Good Grips Food Scale with Pull Out Display. I did some homework first and read reviews and rankings and this one seemed a winner. Once I brought it home, and read the 25 page manual, I was ready to conquer my fear of Macarons and the metric system! It’s really simple to use. It’s very important that you gather all your gadgets & ingredients. You can use a Kitchen Aid or an electric mixer. You also want to carefully measure the aged egg whites, sugar, and powdered sugar. I’m telling you this scale is a genius! You will need a Food Processor, unless you can find Almond Flour. Since I wasn’t able to find it . . . I made my own, by grinding whole raw Almonds to a flour. Once the Almonds are measured, you add them to your measured powdered Sugar and blend to a fine flour. Next you want to pass all that flour through a sieve, to make sure there aren’t any big pieces. I was too nervous to stop and take pictures of the next process. It really wasn’t that difficult though. You simply whip your aged egg whites to a foam, then add the white sugar slowly until you obtain a glossy meringue. 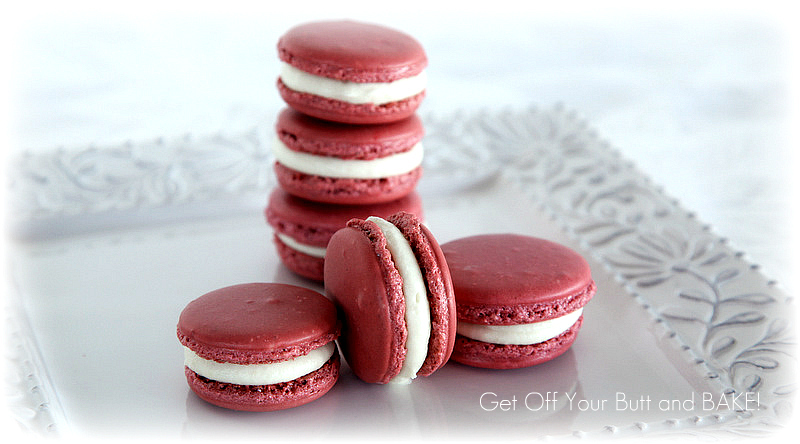 DON’T OVER BEAT, OR IT WILL BE TOO DRY and the Macarons will fail miserably! (Now you know why I didn’t stop to take pictures!) Next comes the ultra scary part: Folding the Almond/Powdered Sugar flour into the meringue. *Note: The recipe calls for Powdered Food Coloring. I searched high & low for this, but was not successful in my search. I knew that I could ruin it all, by adding gel food coloring, but that’s all I had. I carefully folded in Red & Violet colors into the almond mixture. Here’s the thing: If you over Fold your mixture, all the air in the meringue will deflate, and so will your Macarons. If you don’t fold enough, then too much air will cause failure! Now realize . . . that I don’t know much, but after all the reading I’ve done on Macaron technique, the whole process shouldn’t take more than 40 to fifty gentle strokes. I do believe that powdered Food Color would be much, much easier to fold in than the gel. It worked though. You certainly don’t have to color your Macaron. They say blondes have more fun anyway! so . . . my instinct for not knowing what I was doing . . . kicked in, and told me when enough folding was enough! The next thing you do, is add all that beautiful mixture to a pastry bag with a tip. Suggested is the Ateco #807 or #809, but since Wilton is the variety found in our stores, it’s clone is a Wilton 1A. 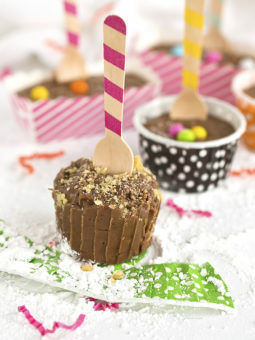 This is the tip, that I decorated those little mini Baby Shower cupcakes. The goal is to make your circles about 1.5 inches in diameter. This was the part that made me the most nervous. Make sure you use parchment paper or a silpat. I promise you once you use silpats . . . you will never look back. note: The batter is not thick, rather it’s a bit runny. Kink the end of the tip up, so that it doesn’t all run out as you fill the bag. I did my best, but my spacing needs some work. You have to make sure that once you pipe your circles, the tops spread and flatten on their own. If they do, then you’re good to go. If they don’t, then give your batter a few more folds with your spatula. Luckily mine obeyed! I read later on, that I should have tapped lightly to remove some of those little bubbles, just like you do a cake. That wasn’t on my directions! I wouldn’t have dared tap anyway. By the time I reached the third cookie sheet, I was getting the hang of it. Those bubbles were sure bugging me though. The next step is to let them sit out for at least 30 minutes to an hour to harden their shells before baking. Bake them in a pre-heated 300 degree oven. For how long? Well . . . this is the perplexing part. The recipe below says 8 to 10 minutes. It was quite obvious that the Macarons were not done through & through. The top felt hard, but they were still gooey on the inside. I quickly looked at a few other Macaron Maker blogs, and they were all between 16 to 20 minutes. YIKES! I just used my instinct, and cooked mine for about 16 minutes, shifting the tray around after 8 minutes of baking. FEET . . . it’s all about the FEET! Do you see the bottom ruffled edges of those miraculous little cookies? Those are your Macaron feet, and evidentally they make all the difference in whether or not they will have the right crunch & chewy center. Once the pan cools, gently peel the Macarons off the parchment paper or silpat and start to match them up by size. I was jumping up & down at this point. Feet . . . lovely feet. Once they are cool, you can fill them with flavored Cream Cheese Buttercream, jam, ganache, berries, etc. Had I known that the gel food coloring would be successful, I would have halved the batter, and made a different color as well. (I actually doubled the recipe below, and I easily had 3 large cookie sheets of Macarons.) The Cream Cheese Buttercream is quite yummy. My favorite frosting is Cream cheese, and this recipe incorporates it along with the whipped egg whites. I do believe it’s now my favorite Buttercream! 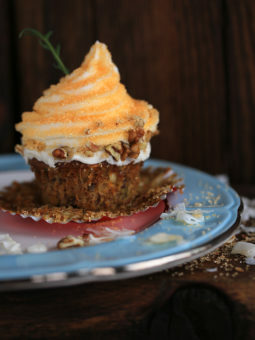 It’s not quite as sweet at the normal Cream cheese frosting, which is a good thing. The Macaron shell is quite sweet! Place your Buttercream in a pastry bag, and pipe circles on top of a Macaron half. I used the 1A tip again. I flavored my Buttercream with Coconut & Pistachio Oil. YUM! Place a top on that best matches the size. See the underside of the Macaron. Most of my cookies looked like this, and I believe that is the way it’s supposed to look. A few of my cookies were somewhat hollow or had larger holes . . . this is not correct! Give it a top hat. or add a dab of Raspberry jelly. I actually made the Macaron shells one day, and stored them in an airtight container. The next day, I made the Buttercream and the Red jelly and filled them. You can store these in Air tight containers, or freeze. So . . . what’s my feeling on the taste and feel of a Macaron? The cookie’s is quite sweet, and I’m glad I didn’t flavor the Macaron shell as well as the Buttercream. I enjoyed these the ‘day after’ more than the day I filled them. They soften ever so slightly, and regain that crispy outside, chewy inside. If you like Meringue cookies . . . you will be in heaven with Macarons. They simply melt & dissolve in your mouth! Will I make them again? YES! If you want to make your own cute little Macarons, but have questions, read Tartelette’s blog, or leave me your comments or questions, below the post. I’m far from a Macaron expert, but I’m glad to help if I can. For the whites: the day before (24hrs), separate your eggs and store the whites at room temperature in a covered container. If you want to use 48hrs (or more) egg whites, you can store them in the fridge. In a stand mixer fitted with the whisk attachment, whip the egg whites to a foam, gradually add the sugar until you obtain a glossy meringue. Do not overbeat your meringue or it will be too dry and your macarons won’t work. 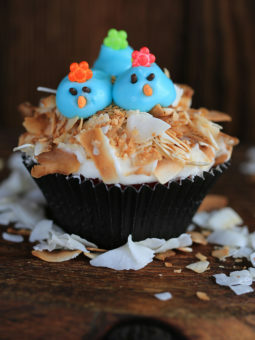 Combine the almonds and powdered sugar in a food processor and give them a good pulse until the nuts are finely ground. Pass through a sieve. Add them to the meringue,with the coloring and give it a quick fold to break some of the air and then fold the mass carefully until you obtain a batter that flows like magma or a thick ribbon. Give quick strokes at first to break the mass and slow down. The whole process should not take more than 50 strokes. Test a small amount on a plate: if the tops flattens on its own you are good to go. If there is a small beak, give the batter a couple of turns. Fill a pastry bag fitted with a plain tip (Ateco #807 or #809) with the batter and pipe small rounds (1.5 inches in diameter) onto parchment paper lined baking sheets. Preheat the oven to 300F. Let the macarons sit out for 30 minutes to an hour to harden their shells a bit and bake for 8-10 minutes, depending on their size. (I baked mine for 16 to 17 minutes. Let cool. If you have trouble removing the shells, pour a couple of drops of water under the parchment paper while the sheet is still a bit warm and the macarons will lift up more easily do to the moisture. Don’t let them sit there in it too long or they will become soggy. Once baked and if you are not using them right away, store them in an airtight container out of the fridge for a couple of days or in the freezer. 1 tsp vanilla extract or vanilla paste or 1/2 vanilla bean split open and seeded, or other flavoring oil. note: I only used raspberries. Your posts always make my day day! Thank you. These look amazing. Love the photos of the step by step. Congrats on the Top 9.